The first recorded proposal to build a canal between the River Mersey and the River Trent was put forward in 1755, though no action was taken at that time. Five years later, in 1760, Lord Gower, a local businessman, and brother-in-law of the Duke of Bridgewater drew up a plan for the Trent and Mersey Canal. If his plan had gone ahead, this would have been the first canal ever constructed in England. 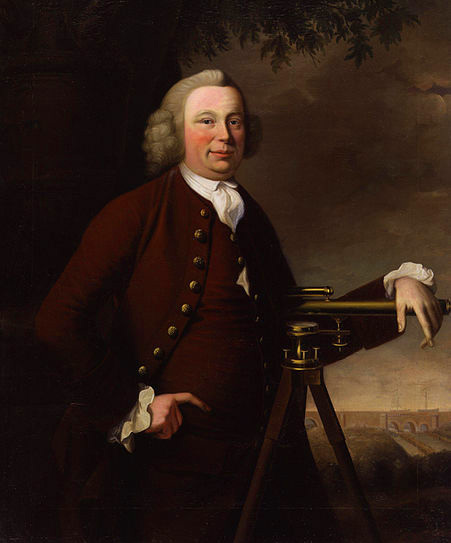 James Brindley (pictured), the engineer behind many of the canals in England, did his first canal work on the Trent and Mersey, though his first job in charge of construction was on the Bridgewater Canal. Josiah Wedgwood was a strong supporter of the idea of a canal through Stoke-on-Trent to provide the smooth transportation from his potteries since road transport of the day resulted in many breakages. In 1761 he pledged his support although his major interest was simply in connecting the Stoke potteries to the river Mersey. Much debate ensued regarding the possible canal routes. Coal merchants in Liverpool were among the strongest opposition feeling that they would be threatened by competing coal from Cheshire. The owners of the River Weaver Navigation were also not happy about the proposals, because the route would almost parallel that of the river. Yet another route was published, which much to the annoyance of Wedgwood, did not go anywhere near Stoke. John Gilbert’s plan for the ‘Grand Trunk’ canal met opposition at the eastern end, where businesses in Burton on Trent objected to the canal passing parallel to the existing Trent navigation. In 1764, Wedgwood managed to use his influence to convince Gilbert that the route should include the Potteries in his route. In 1766, Gilbert’s plan was authorised by an Act of Parliament. Later that year, a large ceremeny was held in the Potteries where Josiah Wedgwood cut the first sod of soil. James Brindley was appointed as engineer. In 1771, still six years before the complete opening of the canal, Wedgwood built the factory village of Etruria on the outskirts of Stoke-on-Trent, close to the agreed canal route. Much of the canal had by now been built towards Preston Brook. The only major obstacle that still had to be solved was the hill at Kidsgrove, through which a tunnel was being dug. Up until 1777, wares from the new pottery had to be carried over the top of Kidsgrove Hill to the other side to the new canal. 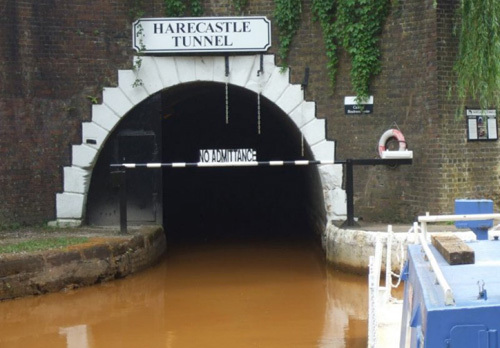 The tunnel was known as the Harecastle Tunnel. Built by Brindley, it was 2880 yards long and barges had to be ‘legged’ through by men lying on their backs and pushing against the roof with their feet. This was a physically demanding and slow process and became somethcreated major delays, so leading civil engineer ing of a bottleneck. Thomas Telford later commissioned to provide a second parallel tunnel wide enough for a towpath. This tunnel was slightly longer at 2926 yards long and opened in 1827. On January 15, 1847 the Trent and Mersey Canal was acquired by the North Staffordshire Railway Company (NSR). This was done to stifle the opposition of the Canal Company to the creation of the Railway Company. In particular, the NSR had plans for a railway from Stoke-on-Trent to Liverpool, however, this line was abandoned due to opposition from other rail interests. The Grand Trunk became part of a larger scheme known as the ‘Grand Cross’, still headed by Brindley. The idea was to link the four main rivers of England – Trent, Mersey, Severn and Thames, linking London to the major ports of Liverpool, Bristol and Hull. The ‘Grand Trunk’ canal became known as the ‘Trent and Mersey’.